The Overhead Switchable Trolley mounts on a 4 inch wide overhead ‘I’ beam. The Road 630V DC is then fed directly from the Contactor to the 630V DC Traction Power supply overhead supply bars. The Trolley Brush collectors pick up the supply from the supply bars. Two 110V AC control supply collectors pick up the supply from two control bars fitted along the length of each road. The Shore Supply Plug is fitted with a Plug Engaged sensor which inhibits the application of Traction Power to the train unless a magnet in the train receptacle to detected. The Trolley supplies Traction Power to trains in the depot area via a Shore Supply Plug. 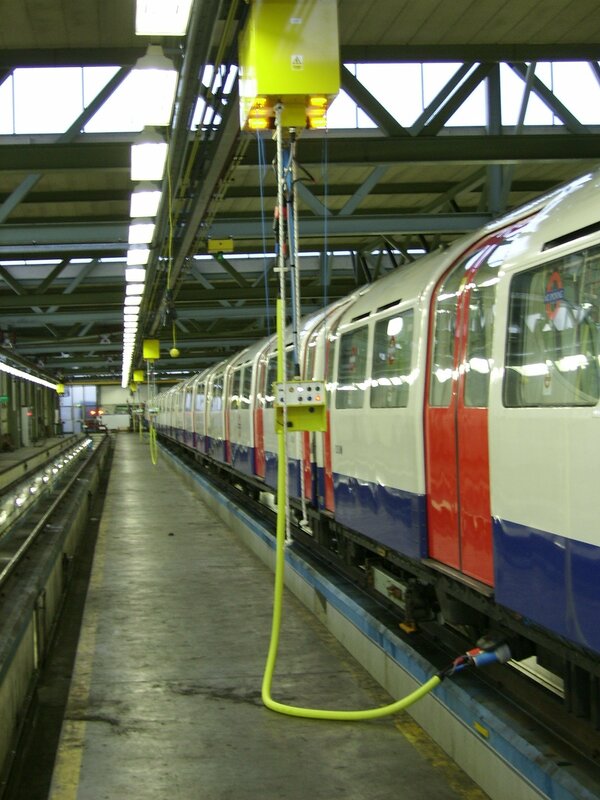 The Shore Supply Plug is stowed in the area underneath the Local Operator Station and hangs from the Trolley. There is a high level frangible link that disconnects under strain thus preventing damage to the trolley should the train be moved out of the depot with the plug remaining in the train receptacle. The left hand section houses the two traction fuses. The centre section houses the contactor, the voltage monitor & fuses, and isolation relay. The carriage mounts on a 4 inch wide overhead ‘I’ beam.